Big banks plead guilty to fixing the foreign exchange market: Will they face consequences? U.S. Attorney General Loretta Lynch answers questions about Wednesday’s criminal plea deals involving five of the world’s largest banks. Not so long ago, federal prosecutors were simply terrified by the idea of what might happen if they ever brought criminal charges against a major bank. They worried that the consequences of a felony conviction might cause a large financial institution to collapse and wreak havoc on Wall Street, much as the accounting firm Arthur Andersen went bust after it was convicted for its role in the Enron scandal. Lately, the government’s lawyers have gotten a little braver. 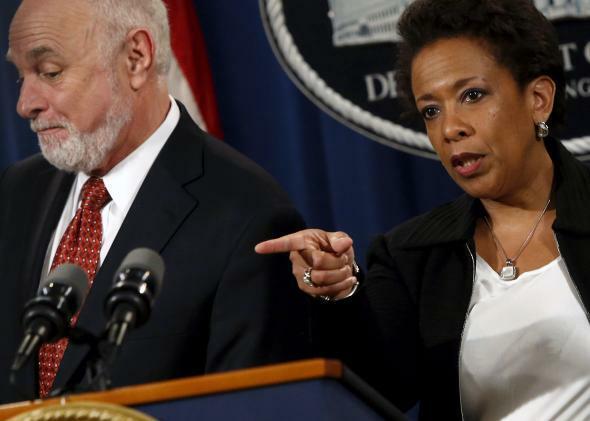 Attorney General Loretta Lynch announced Wednesday that four of the world’s largest banks had pleaded guilty to criminal charges that their traders had conspired to fix the massive and poorly regulated foreign exchange market. Citigroup, JPMorgan Chase, Barclays, and the Royal Bank of Scotland all admitted to being felons. Meanwhile, Switzerland’s UBS, pleaded guilty to manipulating the benchmark Libor interbank lending rate. The five banks are ponying up $5.6 billion in fines. For the banks, though, life as a felon is likely to carry more symbolic shame than practical problems. Although they could be technically barred by American regulators from managing mutual funds or corporate pension plans or perform certain other securities activities, the banks have obtained waivers from the Securities and Exchange Commission that will allow them to conduct business as usual. In fact, the cases were not announced until after the S.E.C. had time to act. So, federal prosecutors are now confident they can bring criminal charges against major banks without ushering in a financial catastrophe, as long as they water down the consequences. Is this progress? Maybe. Promisingly, Bloomberg reports that the Justice Department is still considering bringing charges against some of the individuals involved in the foreign exchange scheme. Even if the targets of its investigation turn out to just be relatively low-level traders, that would still demonstrate some determination to treat blatantly criminal activity as blatantly criminal activity; we are talking about a group of conspirators that had the gall to call itself “the cartel,” after all. Moreover, this is “the first time in decades” that any American megabank has pleaded guilty to a criminal charge, as Reuters notes. Previously, the Justice Department had extracted pleas from foreign banks like Credit Suisse and BNP Paribas. And as I wrote last year, there were reasons, mostly involving cooperation from regulators, to doubt that prosecutors would try to do so with a U.S. firm. Still, so long as banks are allowed to pay for their crimes by simply writing a check, it’s hard to think of these as anything other than ersatz convictions. So here’s the big question. Is the Justice Department still too scared to pursue actual criminal penalties against a bank? Or, now that prosecutors have taken the step of forcing an actual plea from an American institution, will they feel empowered to seek somewhat harsher punishment the next time around? How brave are they, really?